Collectors can score their own piece of the 'Rock at this once-in-a-lifetime auction offering over 600 affordably estimated lots of fine and decorative artwork, jewelry, porcelain, glass, and antiques from one of the most important families in American history. Paul Lucien Maze (1887-1979), Coronation for Abby 1953, estimated at $1,000-2,000. The eyes of the world were glued to the recent NY sale featuring highlights from the family's fine art collection. We don't expect these selections will generate up to 9 figures as the ones in NY did. However, we wouldn't be surprised if our buyers were just as excited - or more - with their wins!" Nadeau's Auction Gallery, one of the largest and fastest growing auction houses in New England, is excited to announce this important, single owner sales event, featuring artwork and personal items from The Peggy and David Rockefeller Collection - including over 100 monogrammed or inscribed selections! This auction, which will finalize the recent, record breaking New York sale of Rockefeller family materials, will be held on Saturday, June 2nd, 2018 beginning promptly at 11am EST. All items from the sale are on display in Nadeau's gallery in Windsor and are available for preview Wednesday, May 30th from noon-4:00pm; Thursday, May 31st from noon-6:30pm; Friday, June 1st from 10:00-5:00pm; and Saturday, June 2nd from 9:00am-11:00am. A special wine and cheese preview will be held on Thursday, May 31st from 4:00pm-6:30pm. Members of the Rockefeller family have always been known for their extraordinary eye for fine art, and the transformational effects it has on people and spaces. This sale offers collectors the opportunity to purchase world-class paintings, sculptures, and other visually stunning works of art - most with their original Rockefeller inventory labels - that until recently graced the family's private home walls, mantles, and other focal points. 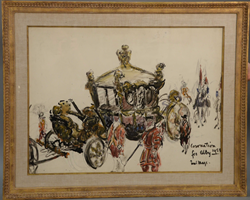 Lot #100, a watercolor signed and dated by Paul Lucien Maze (1887-1979), depicts a regal coach, uniformed guards, and men on horseback. Entitled Coronation for Abby 1953, this painting was acquired as a gift from the artist in 1957 and has its original Collection of David Rockefeller label on verso. It is estimated at $1,000-2,000. "Abby" is the nickname for Abigail Aldrich Rockefeller. Things are twice as nice with lot #433, a pair of signed Brion Gysin (1916-1986) gold-gilt framed watercolors estimated at $ $2,000-4,000. These complementary, peaceful, and earth-toned landscapes include Just Waiting and Blenching Beaches; both retain their original Collection of David Rockefeller labels on verso. 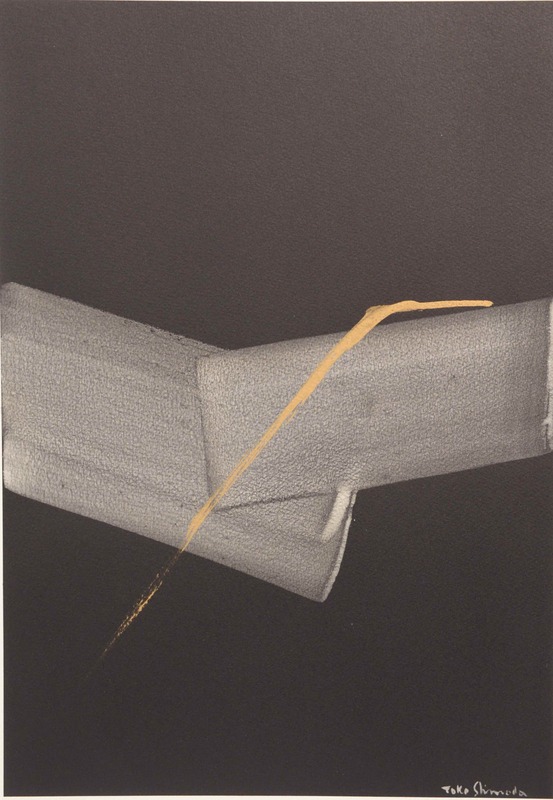 Lot #250, an untitled, mixed media on paper by Japanese artist Toko Shinoda (b. 1913) is estimated at $3,000-6,000. It features its original Collection of David Rockefeller label on verso. Shinoda, who at 105 is still actively creating art, is best known for her work merging traditional calligraphy and expressionistic themes. And lot #300, a signed and dated drypoint etching by Francis Alys (b. 1959) with collage and opaque white highlights, is estimated at $2,000-4,000. 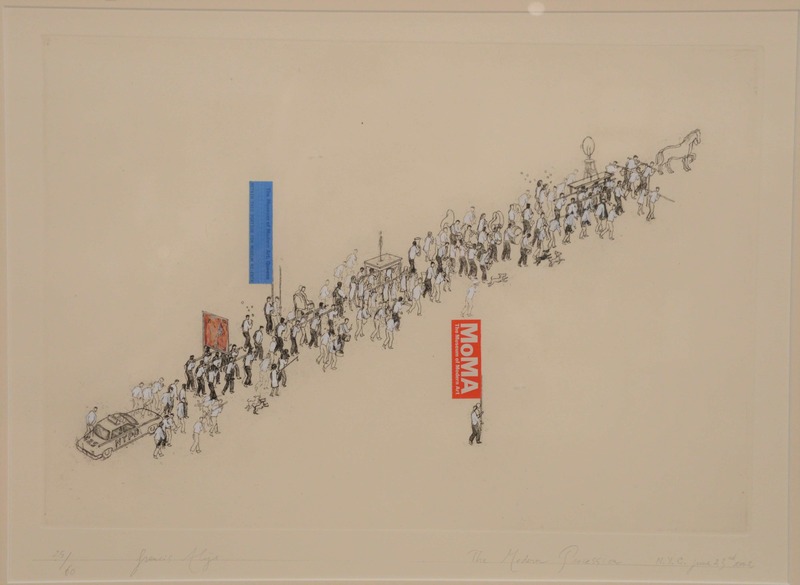 Entitled The Modern Procession, this work features one figure holding a Museum of Modern Art Queen's ticket and another holding a MoMA sign. It is numbered 25/60 and is marked on the verso, indicating it is from the estate of Peggy and David Rockefeller. The $115,000,000 sale of Pablo Picasso's (1881-1973) Fillette à la Corbeille Fleurie as part of Christie’s May 8, 2018 "The Collection of Peggy and David Rockefeller: 19th and 20th Century Art, Evening Sale" in New York City has again focused the world's attention on one of the 20th century's most important and influential artists. 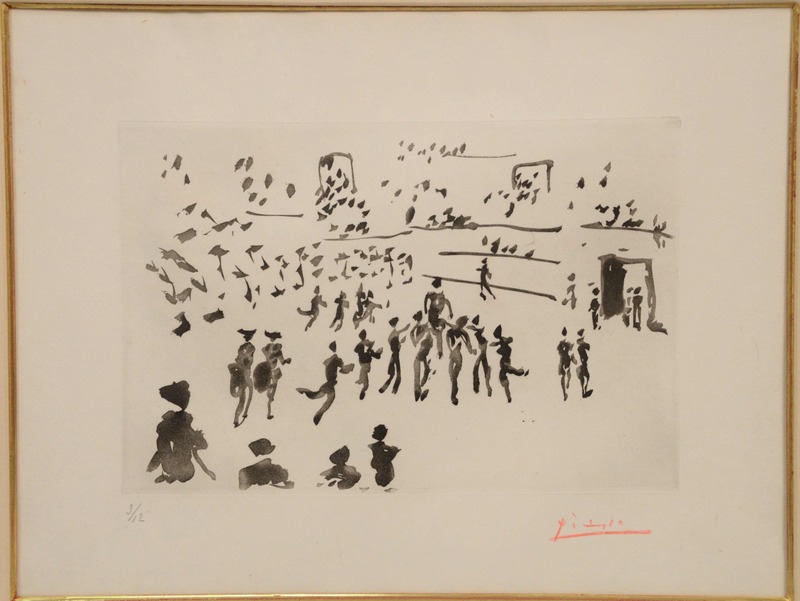 Nadeau's auction also features a number of more accessible Picasso works, including a trio of hand signed bullfighting themed aquatints. Each is estimated at $5,000-10,000. The first, lot #350, is titled Muerte Del Toro (Death of the Bull). The second, lot #351, is titled El Matador Brinda La Muerte Del Toro (The Matador Brings The Death Of The Bull). And the third is lot #352, titled El Torero Sale En Hombros de los Aficionados (Bullfighter Exits On Amateur Shoulders.) Each aquatint is part of an original set of twelve copies, is #3 of 12, and has its original Collection of Nelson A. Rockefeller and Collection of David Rockefeller labels on verso. The Rockefellers were instrumental in launching the world-famous Museum of Modern Art (MoMA) in New York City in 1929. Today MoMA is considered to have one of the finest and most comprehensive art collections on the planet, and members of the Rockefeller family remain active as trustees within the organization. 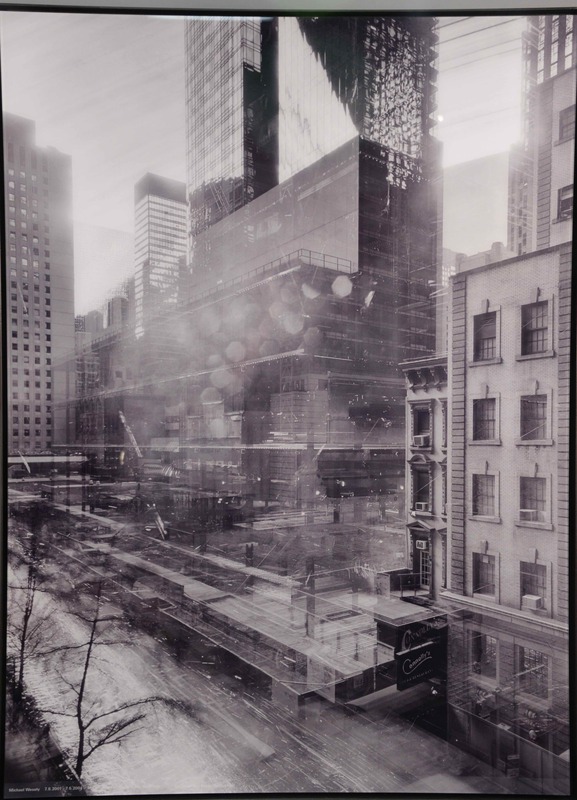 A quartet of large c-print photographs by Michael Wesely (b. 1963) on offer through this sale capture the early-2000 era construction related to MoMA's expansion and renovation. These include lots #301, #302, #303, and #304. Each of these distinctly urban steel framed photographs are signed and dated by the artist, dedicated to David and Peggy Rockefeller, and are estimated at $4,000-8,000. Collectors looking to feather their nests with functional and decorative art rarities from the Rockefeller family collections need look no further than this sale. Outstanding porcelain, glass, and silver selections are available in a full spectrum of price points. For starters, let's point out lot #374, a c. 1820 set of 12 crystal diamond cut finger bowls estimated at $1,000-2,000. They are decorated with a gilt and painted laurel pattern rim and polychrome enamels of classical fignettes of water gods, goddesses, and sea creatures. Lot #508, a signed, silver-plated copper vase from Korean artist Chunghi Choo (1938-1985) is estimated at $500-1,000. This vase is number 3 of an edition size of 35; this identical example was exhibited at the Museum of Fine Arts, Houston. Lot #576, a large signed Philip Moulthrop (b. 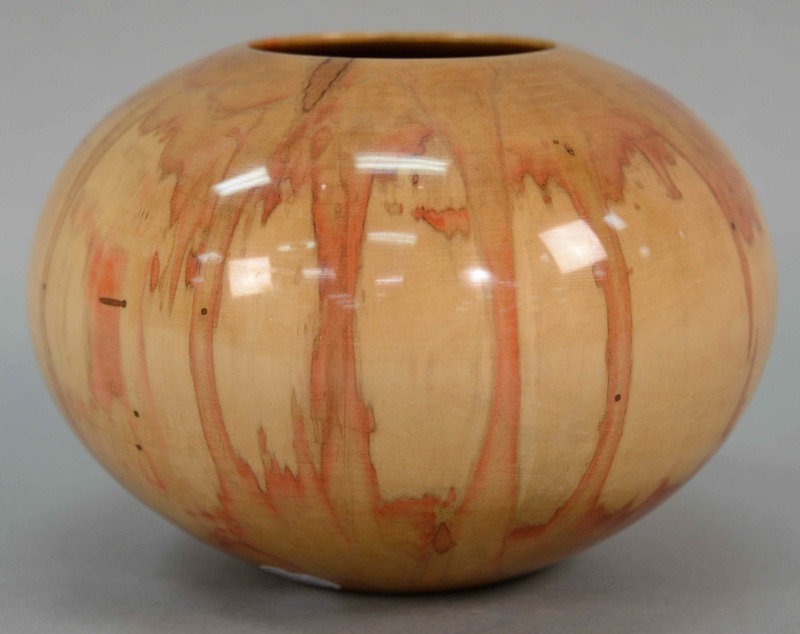 1947), tan and orange finished ash leaf maple turned bowl/vase is certain to be a bidder's favorite, given its good looks and $500-1,000 estimate. Meriting a double take is lot #325, a pair of fully marked Sevres Mahieddine Boutaleb powder blue and gilt porcelain vases, estimated at $ $2,000-4,000. And lot #500, a large, 153 troy ounce sterling silver tray with handles, is certain to be a heavy metal favorite in this grouping. Estimated at $ $2,000-3,000, it is monogrammed A. David Rockefeller Presidente Council for Latin America, has five lines in Spanish, is signed Bruno Pagliai Presidente Mexico, April 1969, and includes twenty-four additional signatures. Asian art selections from the Peggy and David Rockefeller collection add a touch of foreign intrigue to the fantastic array of fine international items on offer through this sale. 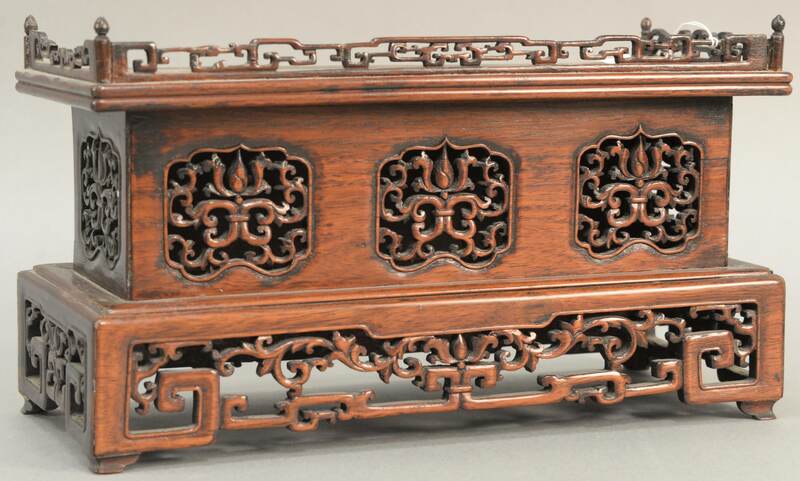 Lot #25, a Chinese hardwood altar table top stand with a reticulated carved gallery is estimated at $300-500. And things are certain to heat up over lot #400, a large Chinese Fahua rectangular censer. 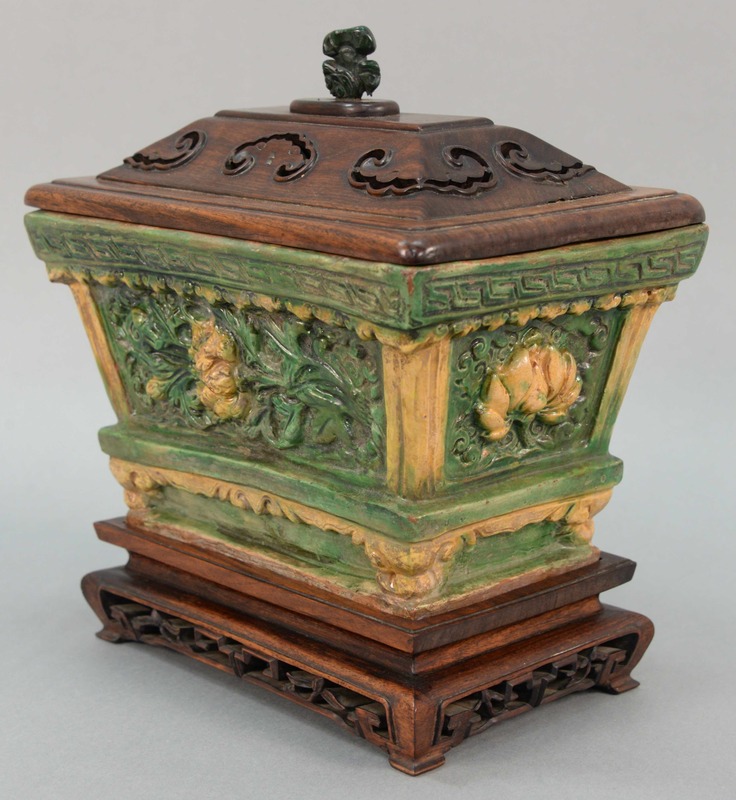 This impressive vessel is boldly decorated with large lotus blossoms against a foliate ground, has a hardwood carved rectangular cover and base, and a dramatic finial. It is estimated at $1,000-2,000. This comprehensive sale rounds out with amazing, interesting, and sometimes quirky selections of furniture, household goods, awards and gifts, sculpture, lighting, and accessories - among other diverse categories. A crown jewel here is lot #32, a Queen Anne walnut veneered dressing table with an inlaid top and decorative metal handles, estimated at $300-500. And lot #3, a "DR" monogrammed Mitsubishi tri-colored 18K cufflinks and tie clip set is the perfect highlight to button up this discussion. Decorated overall with a concentric square design, this handsome and beautifully handcrafted trio is estimated at $400-600. According to Ed Nadeau, President of Nadeau’s Auction Gallery, "We are thrilled to offer part of the Peggy and David Rockefeller collection through our Connecticut gallery. This single owner sale offers collectors, historians, and museums the opportunity to purchase both extraordinary and "every day" items from a leading American family known for its wealth, fine taste, and philanthropy. The eyes of the world were glued to the recent New York sale featuring highlights from the family's breathtaking and legendary fine art collection. We don't expect these selections will generate up to nine figures as the ones in New York did. However, we wouldn't be surprised if our buyers were just as excited - or more - with their wins!" Nadeau's Auction Gallery is a full-service auction house providing a full range of estate offerings, nonprofit deaccession management, and fine art and personal property appraisals. The company presents about a dozen premier sales annually, with a focus on art, furniture, accessories, and important antiques. A second-generation family company, Nadeau's enjoys a well-deserved reputation for outstanding merchandise, top-tier personalized service, and helping sellers realize the realize the maximum value for their collections. The company has been in business since 1985 and today is one of the largest and fastest growing auction houses in New England. Its state of the art auction facility is conveniently located right off Route 91 and easily accessible from all points in the mid-Atlantic and northeast. Nadeau’s Auction Gallery is located 25 Meadow Road, Windsor, CT 06095 and can be reached by telephone at 860-246-2444, fax at 860-524-8735, or email at info(at)nadeausauction.com. The facility is open Monday, Tuesday, Wednesday, and Friday from 8:00am-4:00pm and Thursday from 8:00-6:30pm. For more information on this sale and Nadeau’s Auction Gallery, please see http://www.nadeausauction.com. If you can't make the auction in person, bids for these extraordinary offerings can be placed online through LiveAuctioneers, Bidsquare, and Invaluable or by phone by arrangement. Please contact Nadeau's directly if you wish to submit bids in advance via absentee bidding. Philip Moulthrop (b. 1947), large turned wooden bowl/vase, estimated at $500-1,000. Chunghi Choo (Korea, 1938-1985), silver plated copper vase, estimated at $500-1,000. 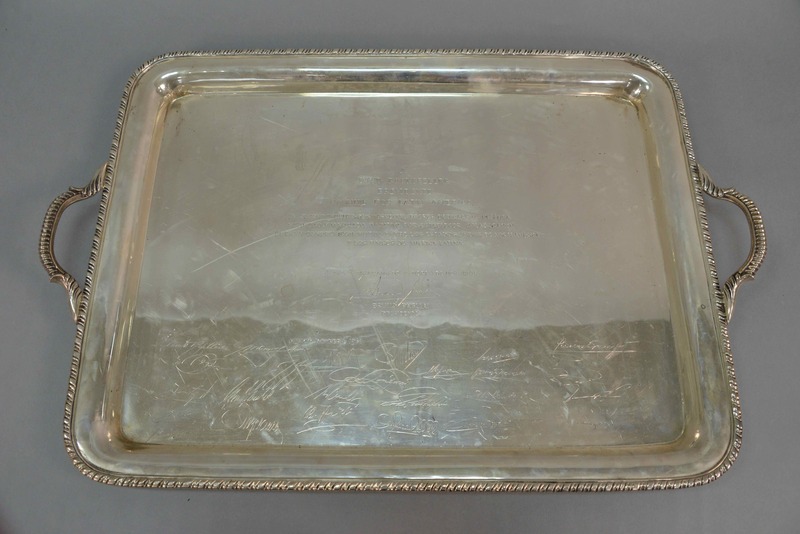 Sterling silver monogrammed handled tray, estimated at $2,000-3,000. Pair of Brion Gysin (1916-1986) landscape watercolors, estimated at $2,000-4,000. Large Chinese Fahua rectangular censer, estimated at $1,000-2,000. Set of twelve crystal cylindrical finger bowls, estimated at $1,000-2,000. 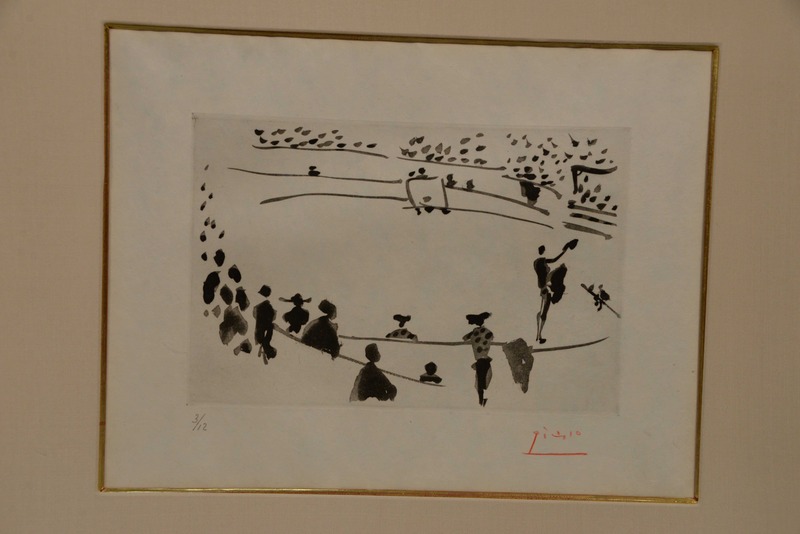 P. Picasso (1881-1973), aquatint, El Torero Sale En Hombros de los Aficionados, estimated at $4,000-10,000. P. Picasso (1881-1973), aquatint, El Matador Brinda La Muerte Del Toro, estimated at $5,000-10,000. 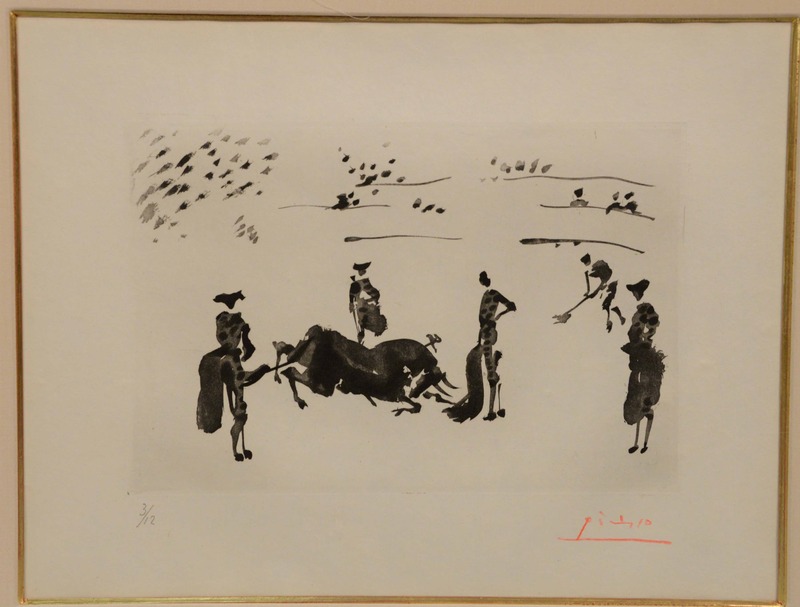 P. Picasso (1881-1973), aquatint, Muerte Del Toro, estimated at $5,000-10,000. 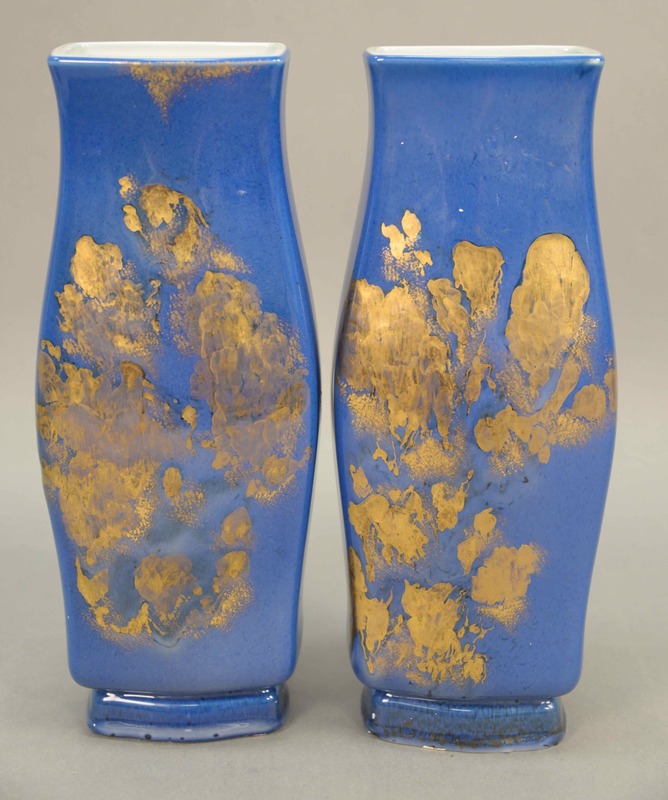 Pair of Sevres Mahieddine Boutaleb porcelain vases, estimated at $2,000-4,000. 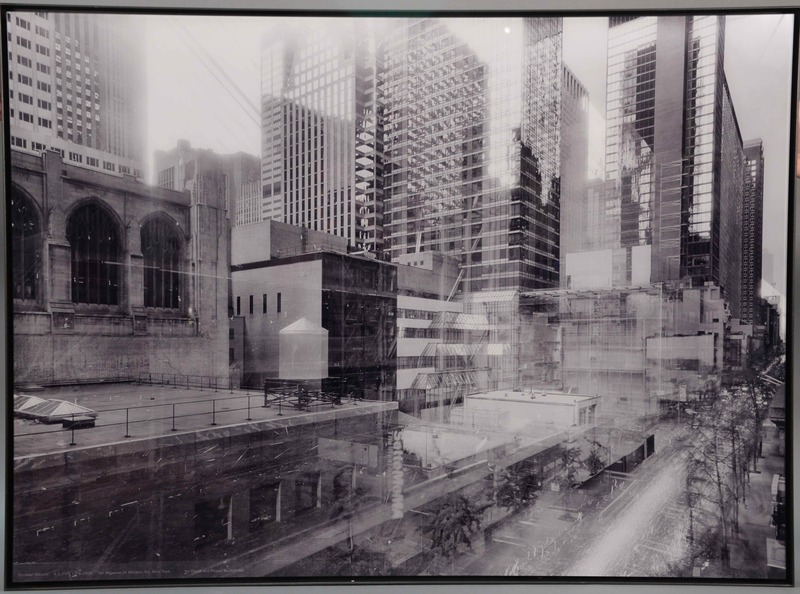 Michael Wesely (b. 1963), photo of MoMA under construction, estimated at $4,000-8,000. 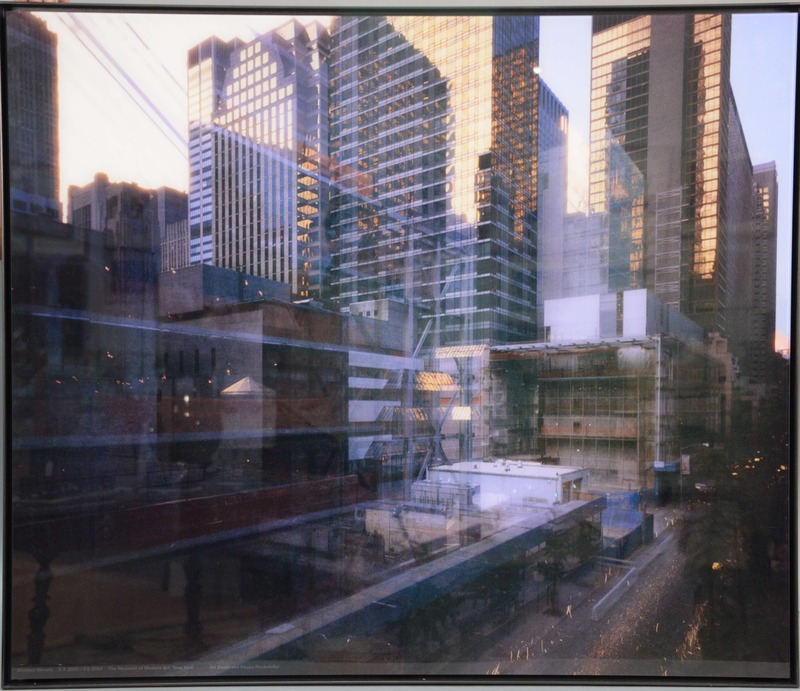 Michael Wesely (b. 1963), photo of MoMA under construction, estimated at $4,000-8,000. Michael Wesely (b. 1963), photo of MoMA under construction, estimated at $4,000-8,000. 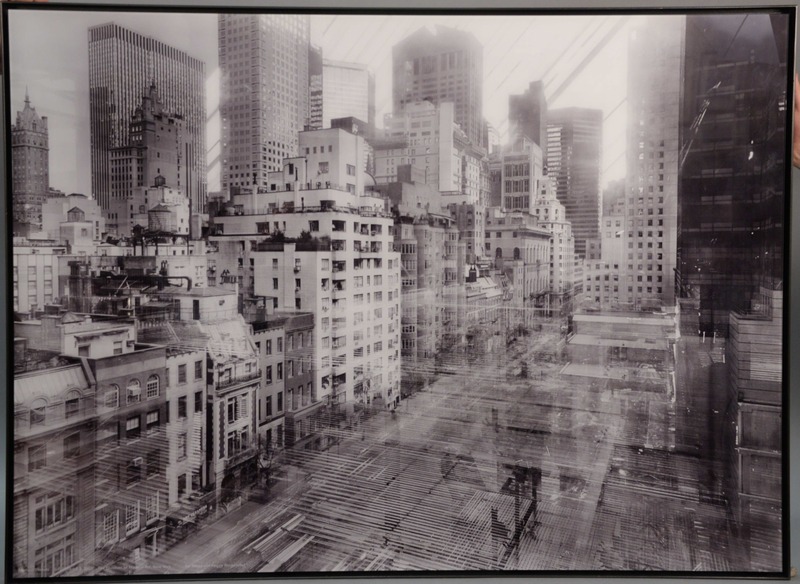 Michael Wesely (b. 1963), photo of MoMA under construction, estimated at $4,000-8,000. Francis Alys (b. 1959), drypoint etching, estimated at $2,000-4,000. Toko Shinoda (b. 1913) mixed media on paper, estimated at $3,000-6,000. 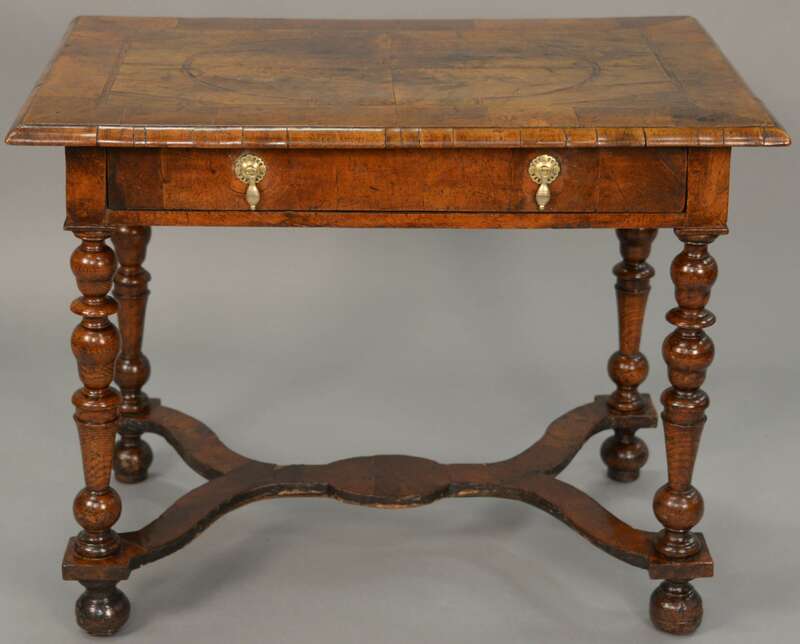 Queen Anne walnut veneered dressing table, estimated at $300-500. Chinese hardwood altar table top stand, estimated at $300-500. 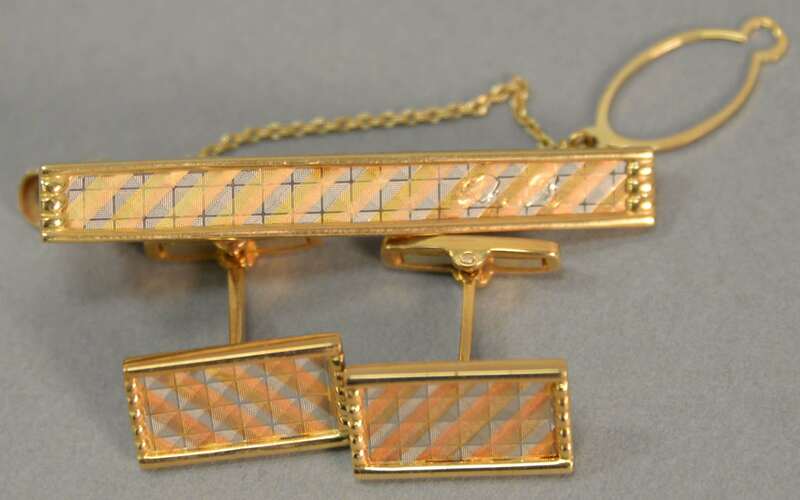 DR monogrammed Mitsubishi 18k cufflinks and tie clip set, estimated at $400-600.